We got a couple of pieces of sockeye salmon. 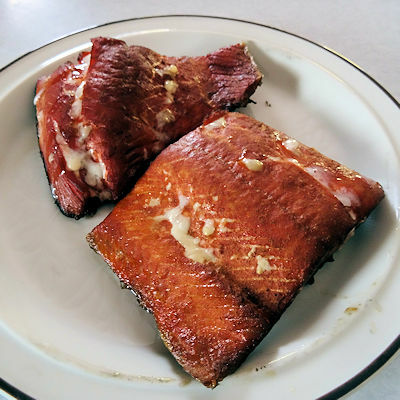 I usually brine or marinate my salmon but I decided I wanted to see what it would be like if it was just smoked. 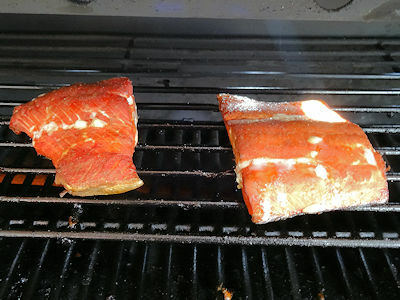 So I sprinkled some seasoning (barbecue spices) on the salmon and put in the Louisiana Grills pellet smoker at 180 F for an hour. I put it on low as the smoker generates more smoke at lower temperatures. Then I turned it up to 300 F and the salmon was cooked in 15 minutes. This had a nice smoke taste and a great texture. I do prefer the increased complexity of more marinading and spices but this was surprisingly good. However, if you want to try something really special, here is a recipe that is a bit more work but very special.